Conrad Wolfram, probably the only modern mathematician that anyone outside the field might have heard of, wants to build a new math curriculum. One that actually assumes computational devices exist. Think about how most of the math problems presented to students are structured. They are required to remember the right algorithmic process, stick in the numbers, and grind the wheels until the “right” answer pops out. And repeat with the next one in the set. That has changed very little since I was in high school and I have the textbook on my shelf to prove it. The way mathematics is actually used, is very different. In reality, math is a tool used to help solve problems in a variety of fields from business to social science, science to the arts, engineering to even linguistics. About the only place math is studied independently is in pure research. And K12 schools. So, what about the hot new topic of coding? Everybody needs to learn that, right? Coding is crucial. If you think about coding as learning how to abstract a problem, which I think is really hard especially the fuzzier and more complex the problem gets, then I think it’s good we’re seeing this being encouraged. I think that tying math together with computational thinking and other subjects, and combining it with code, would be the absolutely ideal direction for the future. Learning to code, like math, is not an independent course of study. It is also a tool that must be learned in context. There’s more to this interview and it’s worth a read. Wolfram is right that we need to completely revise the K12 math curriculum to focus on “computational thinking” instead of having students crank through processes better done by machine. I’m just not as confident that the change will happen as quickly as he seems to believe. 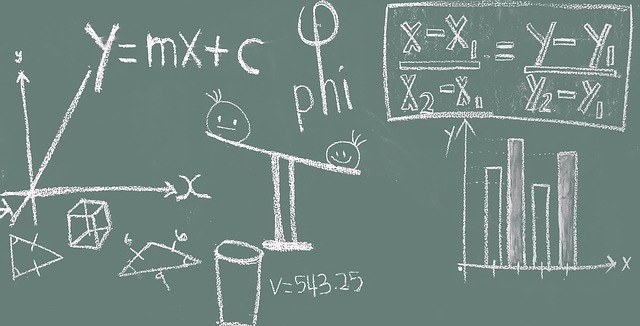 Image of a chalkboard with math symbols I might have written when I was teaching the subject is a free download from Pixabay and is used under a Creative Commons license.